Resident of water contaminated areas ask the Govt of India when will the Union Carbide’s toxic waste be cleaned up? 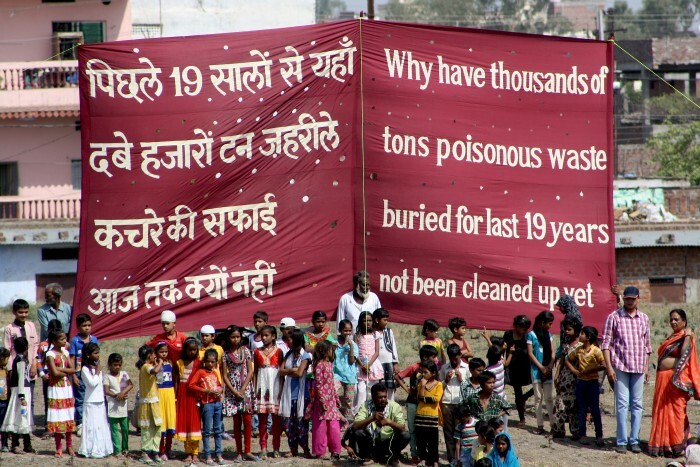 On the occasion of World Environment Day residents from the neighbourhood of Union Carbide’s abandoned factory in Bhopal demonstrated against the Indian government’s failure in removing thousands of tons of poisonous waste for the last 19 years. Hundreds of residents stood in the form of a question mark and held a banner atop the mound below which the hazardous waste lies buried. The demonstrators said that the question mark was meant to signify the many unanswered questions about the ongoing contamination in an area greater than 20 square kilometres. According to five organizations who jointly organized today’s demonstration, several thousand tons of hazardous waste from the Union Carbide pesticide factory was buried under the mound in 1996 by the factory management. The waste is known to contain chemicals that cause cancers and birth defects and damage the liver, kidneys, lungs and the brain. The organizations said that in October 2012 the Lucknow based Indian Institute of Toxicology Research had reported that the groundwater in 22 communities with 10, 000 resident families is contaminated. 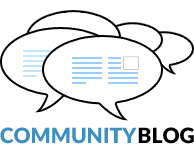 According to them further tests have shown that the contamination has spread beyond 22 communities and it will continue unless the buried waste is removed from the site. “It is Union Carbide that buried the waste next to our homes. Why is the Indian government not able to make Union Carbide’s current owner Dow Chemical accept legal liability and clean up the toxic waste?” said Rashida Bee, President of the Bhopal Gas Peedit Mahila Stationery Karmchari Sangh. Balkrishna Namdeo of the Bhopal Gas Peedit Nirashrit Pensionbhogee Sangharsh Morcha condemned the Environment Minister’s recent refusal to seek help from the United Nations Environment Programme (UNEP) for a comprehensive scientific assessment of the depth, spread and nature of contamination. He said that without such assessment no clean up could even begin. “Hundreds of children are being born with horrific birth defects because their parents drank contaminated ground water for upwards of 20 years. Unless the hazardous waste is excavated and disposed off safely, the toxic contamination will continue to maim generations to come.” said Nawab Khan, President of Bhopal Gas Peedit Mahila Purush Sangharsh Morcha. Satinath Sarangi of the Bhopal Group for Information and Action said that a legal petition for removal of the hazardous waste and clean up by Dow Chemical was pending before the Madhya Pradesh High Court for last 11 years. “It is shocking that the judges continue to drag their feet on an issue that concerns the destruction of lives and future of hundreds of unborn children.” he said. 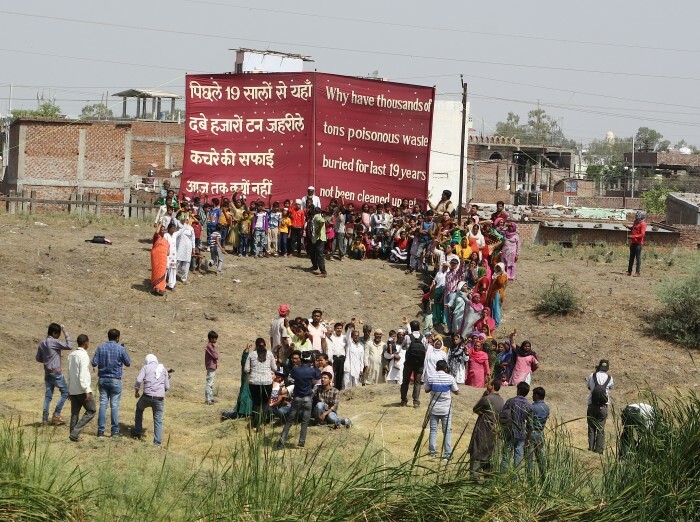 “The saddest part of this second disaster in Bhopal is that it is finding new victims every day while government agencies that are supposed to protect our health and lives stand by doing nothing.” said Safreen Khan of Children Against Dow Carbide. Hindi Press Release is available here.